An ACIM is classified as an asynchronous motor because the rotor's motion may not keep up with the stator field's rotation. The difference between the rotor and the stator field is called "slip"
Alternate Current (AC) Motors are motors in which a variable current flows through the stator. The current variations can be in a series of smooth sinusoidal cycles or can occur in abrupt digital transitions. Rotation of an AC motor is caused by sequencing the current cycles among the individual stator windings. Depending upon the material used to make the rotor, the rotor will be drawn toward an activated winding by either magnetic attraction or magnetic reluctance. The speed of an AC motor's rotation is dependent upon the speed in which the current changes are sequenced through the stator windings. Air Gap refers to the distance between the rotor and the stator. The amount of current needed to influence a motor's magnetic field is directly dependent upon the size of the air gap. Motors with larger air gaps consume more current than motors with smaller air gaps. If the air gap is too small, the variances in the magnetic field will overcome the stiffness of the drive shaft causing the rotor to bump against the stator as it rotates. Asynchronous Motors are AC motors designed such that the rotor movement is not synchronized with the moving stator field. An asynchronous motor's rotating stator field induces a current in the rotor windings. This induced current in turn generates a force drawing the rotor toward the stator. In an asynchronous motor torque is only generated when the rotor is not in phase with the stator. If the rotor were to become aligned with the stator field the torque would disappear thus causing the rotor to pause. The stator field basically pulls the rotor. This lag between the stator and the rotor is commonly referred to as slip. Commutation is the action needed to induce motor in a motor. In an AC motor, commutation is achieved by sequentially switching current in the phases. In Brushless DC motors, commutation is self-induced as the rotor motion causes the motor to commutate. Direct Current (DC) Motors are motors in which the rotor is activated by a steady current. The force causing the rotation in a DC motor is caused by the interaction of the rotor current with the stator's magnetic field. The speed of the motor's rotation is a function of the amount of current flowing through the stator. The Rotor is the portion of the motor that rotates in an electric motor. The rotor is attached to the drive shaft and interacts with the stator. The Stator is the stationary portion of an electric motor. A Stepper Motor is a DC motor which moves in discrete steps. The coils are organized into phases. When the phases are energized in sequence the motor will rotate in precise increments. Synchronous Motors are AC motors in which the rotor maintains the same frequency and phase as the rotating stator field. Torque is the measure of how much force is acting on a motor to make it rotate. 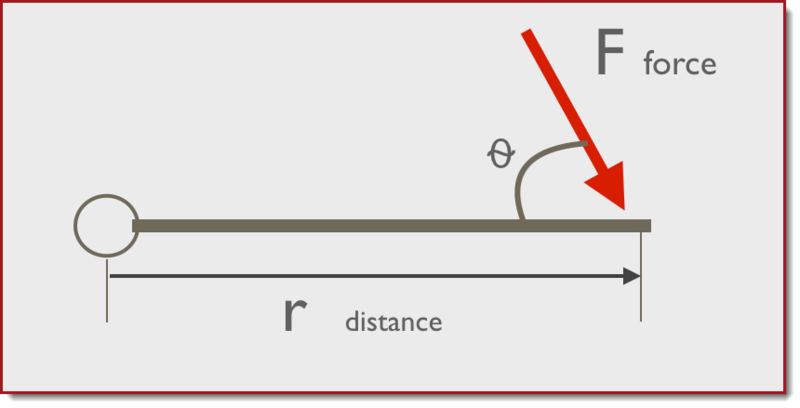 Typically defined in terms of Newton-Meters (N m), torque (𝜏) is a calculation of the amount of force (F) asserted on the motor and the distance (r) from the fulcrum in which the force is asserted. Torque Ripple is the variance in a motor's torque as the rotor moves through the stator windings. Quantified as a percent of change in a motor's power output, torque ripple can be of significant concern in applications where a smoothly operating motor is essential. Motors with excessive torque ripple will experience vibration and may emit audible noise.